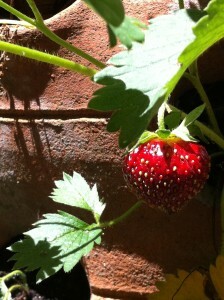 What to do with fresh ripe strawberries? Other than just eating them plain out of your hand, what about making an easy tart? My Strawberry Almond Tart combines puff pastry, almond pastry cream, sliced ripe strawberries, toasted sliced almonds, and a dollop of sweetened whipped cream! I made this dessert for a small dinner party last weekend. You could have heard a pin drop in the room while everyone was devouring their individual tart! It’s best to use ripe fresh strawberries for this dessert. 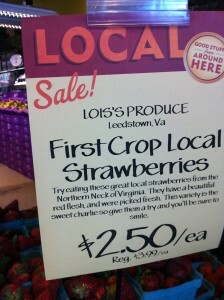 My local Whole Foods Market carries organic berries all year-round. Usually they are the best in the summer. Buy locally if at all possible. Start out by making some pastry cream. I like to use Martha Stewart’s pastry cream recipe, and adding just a few drops of almond extract while warming the milk. 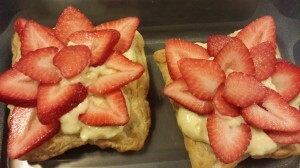 Use your favorite pastry cream recipe or use Martha’s. Or, you can use vanilla pudding with some added almond extract but I find that the pudding can become runny and separate. Be sure to chill the pastry cream for at least two hours before you assemble the tarts. Then, bake your pastry shells. 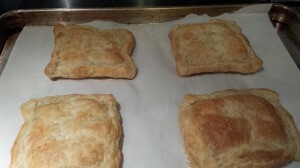 Thaw out some puff pastry dough and cut it into four squares. 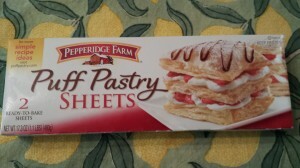 I like to use Pepperidge Farm’s frozen puff pastry dough. Fold over the sides of the dough squares to make little borders, place on parchment-lined baking sheet, and bake according to the package directions (usually 400 degrees Fahrenheit for 15 minutes) until lightly browned. Remove from the oven and set aside to cool. When the pastry cream has chilled, and the tart shells have cooled, you can start to assemble the tarts. Spread some pastry cream over each tart shell. 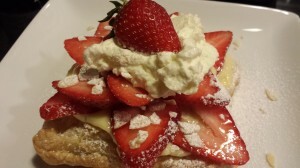 Slice your ripe strawberries and arrange them over the pastry cream. You can be fancy or just pile up the berries. Refrigerate the tarts for one hour or up to 8 hours. Whisk the whipping cream, some almond extract, and a bit of powdered sugar in a bowl until stiff peaks form. 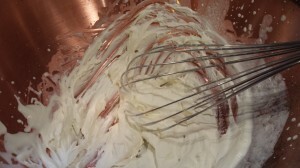 I like to use my copper mixing bowl as it will quickly set up the cream. Chill the whipping cream until you are ready to serve the tarts. When ready to serve, remove the tarts from the refrigerator. 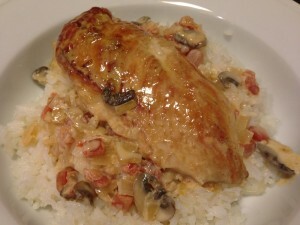 Place on serving dishes. Sprinkle some toasted sliced almonds over each tart. Top with a dollop of whipping cream and a whole strawberry. Dust with some powdered sugar, and serve! This is a dessert that will be devoured quickly if history is any indicator. 1. Make the pastry cream and refrigerate it for several hours or overnight. 3. Cut the thawed pastry dough into four equal pieces, folding over the sides of each to make a border. Place the dough on a parchment-lined baking sheet. 4. Bake the puff pastry shells according to package directions (usually 15 minutes). The shells may puff up while cooking. That’s ok, they will recede a bit when filled with the pastry cream. 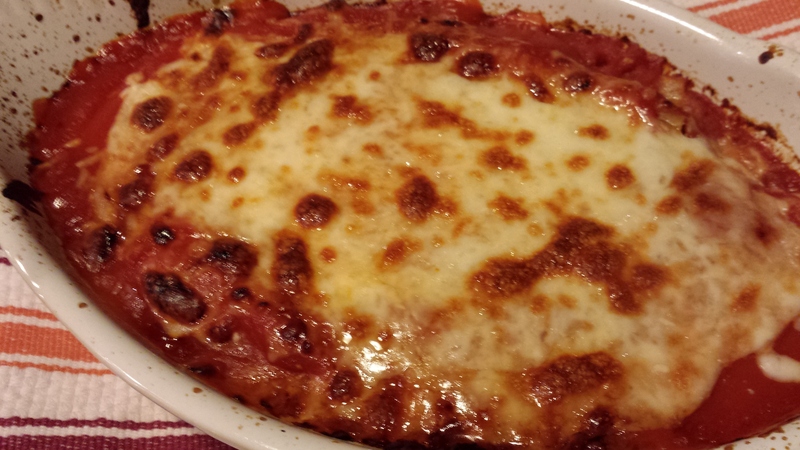 Remove baked shells from the oven and let cool. 5. Slice the strawberries and set aside. 6. When the puff pastry shells are cool, place on four dessert plates. 7. Divide the pastry cream amongst the shells, and spread over the shells. 8. 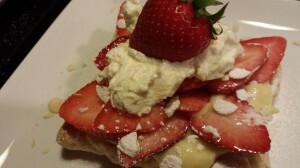 Top with the sliced strawberries and a dollop of (optional) whipped cream. 9. Sprinkle with toasted sliced almonds. 10. 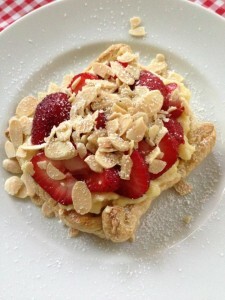 Add a whole strawberry to garnish each tart, and dust with powdered sugar. Makes 4 individual tarts. 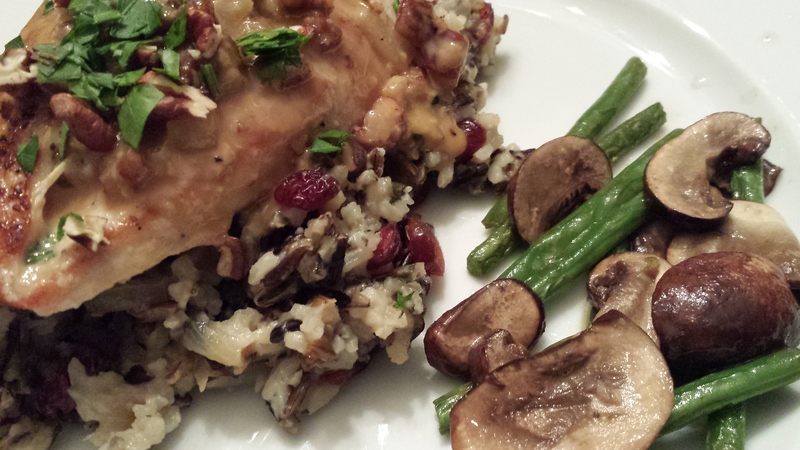 Serve as a dessert with after-dinner coffee or a small snifter of Amaretto liqueur!